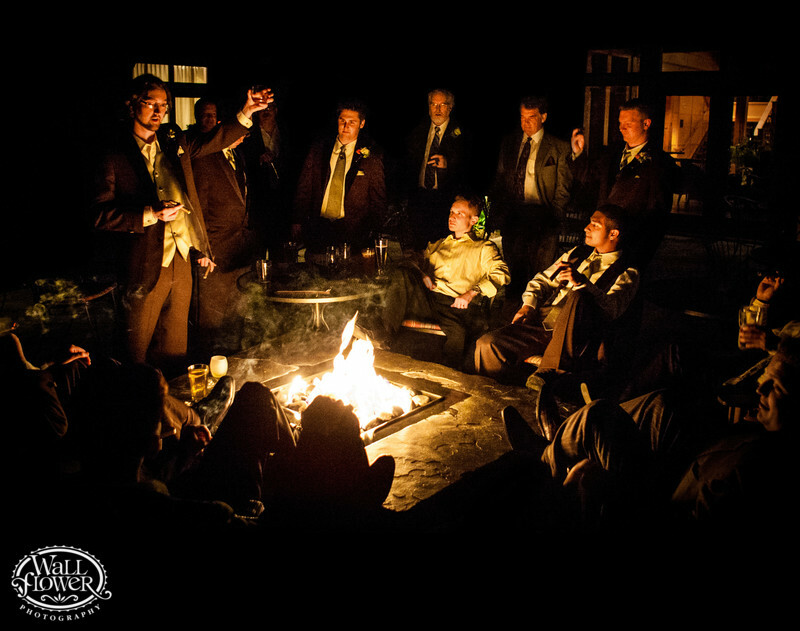 I won an award with this photo of the groom raising his glass of bourbon and giving a little speech to his groomsmen and other male friends late in his wedding reception at Willows Lodge in Woodinville, Washington. They had headed out to the back patio, where a nice fire was already blazing, to smoke cigars and escape the noise and bustle of the party raging in the ballroom. That fire is the sole light source in the photo — can you imagine how firing my lights would have destroyed this photo? Obviously, fires aren't particularly bright, and I wanted decent depth of field to have some sharpness in all the faces, so this was shot with a high ISO. It was really grainy, and I spent some time smoothing out that grain in Adobe Lightroom and Photoshop. It won an award in a wedding photography competition held by the Wedding Photojournalist Association (WPJA).